BiMUp Warehouse™ is a library of BiMUp Ready Components™ and BiMUp Data Rich Objects™ designed in SketchUp® and dedicated to The Construction Industry. 3D Models, 2D Symbols, Books/Tutorials and Textures/Patterns/Styles every day. 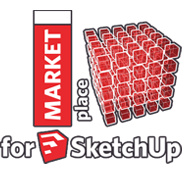 and become a BiMUp MARKETplace™ for SketchUp Author. and you will be able to upload, set the price and publish your files for sale. All BiMUp Ready Component™ follows a strict SketchUp/BiMUp Layering Convention where each element's visibility can be controlled by switching SketchUp Layers to ON/OFF.